We have reached the point in the evolution of this site where the main stone risk factors are introduced and detailed, and the importance of citrate established. I have written about the price of potassium citrate because many patients and physicians have told me that it has risen steeply in recent months, and I would like to be of help. In this post I will mention beverages and medications by name. Let me be clear: I have no financial relationships with the companies that produce or sell the products I write about here. Likewise neither I nor my colleagues at University of Chicago receive any support, financial or otherwise from these companies. WHAT DOES CITRATE DO FOR PATIENTS? Some patients produce too acidic a urine which raises risk of uric acid stones, and they need supplemental alkali to make their urine less acidic. The use of potassium citrate to make urine less acidic will prevent uric acid stones in most patients who form them. Some patients form calcium stones because they produce urine that is low in citrate, a valuable inhibitor of crystal formation. Most of the naturally occurring inhibitors in urine are complex molecules about which we can presently do nothing. But citrate is a small and easily measured molecule which we can prescribe and which will increase the urine citrate in at least some patients. Potassium citrate lowers urine calcium excretion. In so doing it reverses a key kidney stone risk factor. In trials potassium citrate reduced stone formation. I have a long list of sodium’s undesirable effects. It can raise blood pressure in large numbers of people, especially with age. It raises the amount of calcium lost in the urine, and that increase of calcium can raise supersaturation and promote calcium kidney stones. High sodium intake can reduce bone mineral retention. But, it may be that the sodium in sodium bicarbonate causes less of these problems than the sodium in sodium chloride – table salt. So I offer sodium bicarbonate as an alternative – with reservations. Because sodium produces problems of its own, we tend to use potassium citrate as the preferred medication, and generations of stone patients have taken it. In several trials it has reduced new stone formation when given to patients whose urine is citrate deficient. I am not at all sure why the pricing of potassium citrate has become a topic I often hear about from patients, doctors, and just about everybody in the kidney stone world. Certainly the price must have increased, but I cannot find data on the web to prove the point. I also believe Medicare and perhaps other insurers have altered the status of this drug in their payment schedules. Perhaps some of you know more about the problem than I do and are willing to share what you know by way of a comment. I did find on inspection of the Medicare lists of drug prices by insurance plan that some plans appear to include potassium citrate pills in their formularies at a preferred level and charge as little as $10 for what appears to be 90 pills. Others do not do this and publish higher prices, often as percentages of the retail cash price. Once again, I hope those of you with experiences in purchasing the drug will share what you know. Listening to agitated, and worrisome stories about inflated prices for potassium citrate, I decided to try to be helpful. A Google search for prices of potassium citrate yielded a few promising shopping sites, and on study of the prices I found some much better than others. Note that in the following sections I present a lot of prices and arithmetic. Sometimes, when the message is very clear the results are rounded for simplicity. I give the basis for every calculation if you want absolute exact answers to the nearest penny. Likewise, because we are comparing prices, I have chosen 4 pills daily as my cost basis. The actual range can be from 2 to 6 pills or even more daily, so you will have to adjust costs to your own prescription. GoodRx gives what I believe is the clearest list of prices. On their site, Sam’s Club was least expensive at $145 for 180 pills or $0.805 per pill. A typical 4 pills per day treatment option would therefore come to $290/quarter, which is still very pricey. The site gives a long list of other stores whose prices are even higher. Everyday health offers an approximate price for Cytra-K and Polycitra K of $50 – $99, but I could not be sure if this was for a month and likewise how much medication was in a dose. So far as I can tell, importing from Canada will not save you much money. I found Urocit K at $1.10 per tablet, which is higher than Sam’s Club. Another generic, K-Citra 10 was $0.79, which is about the same as Sam’s Club. Another less desirable canadian price was $0.52 per pill if you buy 90 pills, but it was for the 5 mEq size, 1/2 of the usual and therefore the corresponding price for 10 mEq would be $1.04/pill. Given that some costs must accrue for mailing, and there are issues with importing, I cannot see an advantage right now. Certainly web shopping is a good thing because in my modest and amateurish shopping efforts I found a tremendous range of prices. I am sure that many of you who read this post are far more skilled than I am at shopping for best prices. It is time for you to step forward and share your knowledge with all of us by posting a comment. Everyone will benefit and appreciate your contributions. But even if you shop better than I did, retail pricing for this medication seems too high for most to afford. At even 4 pills a day, and at the best price I found ($290.00/quarter) we are over $1000.00 yearly for this one product. It seems to me that if your plan does not subsidize this medication, cost could be a serious issue. A useful publication reports the alkali content of commercial beverages. The ‘lemonade formula’ referred to on the graph is given as 1/2 cup ReaLemon© mixed with 7-1/2 cups of water and sweetened to taste with sugar or artificial sweetener. 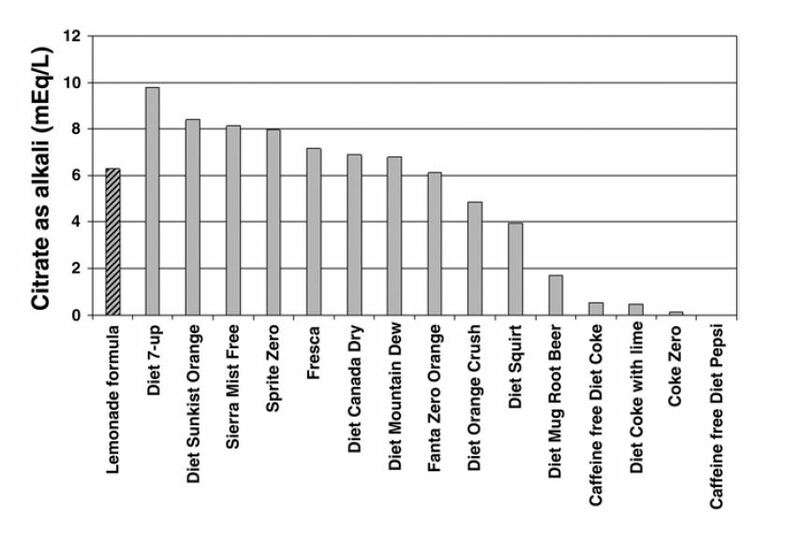 Diet 7-up was the winner with 10 mEq of citrate in a liter. A single Urocit K tablet contains 10 mEq of potassium citrate, as a comparison, so you would need 4 liters of the beverage daily to match 4 pills. My colleague Dr. John Asplin has measured an additional group of products: Minute Maid Lemonade contains 10.3 mEq/liter of alkali, like Diet 7-up. Gatorade contains only 8.3 mEq/liter. But Crystal Light Lemonade contains 21.7 mEq of alkali, so it is the winner. Each liter substitutes for 2 potassium citrate pills, $1.60 a day, or $144 every 3 months. Crystal Light beverages include teas and other drinks. Our measurements refer to the classic or standard lemonade beverage. In what follows all of my remarks at bounded by that limitation. For example, I do not know if liters of the Crystal Light tea might contain excessive amounts of oxalate. I did not research the price of Crystal Light Lemonade extensively, but Crystal Light Lemonade Pitcher Packs – 3-Pack – are $27.95 at Amazon. Each 3 pack provides 96 quarts of beverage. Each quart is about one liter (0.946 liters to be exact). The cost is therefore $27.95/96 or about $0.29 per 20 mEq (2 pills). This comes to $0.58 daily or $52 every three months. The Amazon site points out that prices might be lower at other stores. Please comment on the best prices you have found so everyone can benefit. You may have read, on a label or in a scientific paper, that some of the beverages I have listed contain quite a lot of citrate, yet we show them as inferior as an alkali. The reason has to do with the form of the citrate. If the drink is made up in a very acidic manner, much of the citrate is citric acid and will not produce alkali in the body when metabolized. It is only when the molecule is citrate itself, not the citric acid, that it can benefit you as an alkali. The graph and the additions by Dr. Asplin present the true alkali content. The beverages are mainly diet so they do not add to your caloric burden. If you sweeten them, or lace them with fruit juice, or add fruit juice or other flavorings to baking soda – see below, you will be adding calories to your diet and that may not be ideal. But apart from weight gain, sugar has undesirable effects specific to kidney stone formers: It raises urine calcium losses. Even worse, as the article points out, urine flow rate falls as urine calcium increases, so supersaturation rises for two reasons. According to Google, a teaspoon contains 4,500 mg of baking soda (sodium bicarbonate). Given the molecular weight of 84 mg/mEq (each molecule is one mEq of alkali) the teaspoon contains 53 mEq of sodium alkali. In principle, therefore, one can get alkali for nearly nothing by way of price. According to Dr. Asplin, who has – unbelievably – determined such matters, a teaspoon can contain up to 6,100 mg of baking soda depending on packing and whether the teaspoon is level or heaping. To get 20 mEq of alkali from baking soda would require about 1/3 teaspoon. Given the variability of what a teaspoon holds, and the sheer problems of fractions of a teaspoon for every dose, I strongly recommend we abandon the remarkable cost savings from baking soda and use sodium bicarbonate tablets, which are very inexpensive and measure out the dose for you. You can buy sodium bicarbonate tablets OTC and they are cheap. 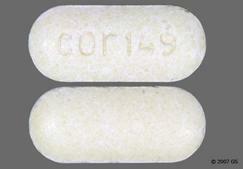 Concord, via Amazon, sells one hundred 650 mg tablets for $14.95 ($0.14 each). Rugby sells 1000 tablets of the same size for $25.77 ($0.026 each). Because each tablet contains only 7.7 mEq of alkali, it takes about 3 to match 2 K citrate pills (I realize 7.7 times 3 is 23.1 mEq but it approximates 20 mEq and the difference is not important). But that is only $0.075 for the three. So the price can come way down with this form of alkali. But, alas, the 1/3 teaspoon, or the three 650 mg pills, deliver 20 mEq of sodium for each 20 mEq of alkali. The extra 20 mEq of sodium is 460 mg, about 20% of a full day’s sodium intake. For the 40 mEq (4 potassium citrate pills) we have used as a benchmark thus far, it is 40% of a full day’s sodium intake. Whereas I am unconcerned to recommend beverages as replacements for potassium citrate pills, I have considerable reservation about sodium loads for reasons I have already mentioned and repeat here for emphasis. Excess sodium intake can raise blood pressure in those who are sensitive to salt. Although we have not as yet discussed urine calcium losses as a risk factor for stones, sodium loads will raise urine calcium, and are therefore not beneficial in that respect. If you are taking a diuretic to reduce urine calcium for stone prevention, sodium loads will reduce the efficacy of the treatment and promote losses of potassium. People with heart disease may develop worsening heart failure. Always ask your physician before using sodium bicarbonate as an alkali. Even so, sodium bicarbonate is not sodium chloride – table salt. For physicians I have reviewed a few papers on the subject. If I sound ambivalent, I am. We may need a few more trials on this subject. In the mean time, all of my reservations hold sway. Use sodium bicarbonate sparingly. Compromise is the best policy, and I offer a general scheme which patients and physicians can use, if they wish, with their personal alterations. Be sure and check that your combinations provide the dosages your physician wants you to have. Each potassium citrate pill is 10 mEq; 2 are 20 mEq of alkali. Each liter of Crystal Light is just over 20 mEq of alkali. Each OTC 10 grain (650 mg) sodium bicarbonate tablet is 7.7 mEq of alkali so 3 make 23 mEq. Consider dividing the day’s alkali into 3 parts: Beverages; sodium bicarbonate; potassium citrate pills. If we only need 2 10 mEq potassium citrate pills (20 mEq), substitute 1 liter of Crystal Light (20 mEq). It is part of the day’s fluids, but also like a medication, so spread its use out over the day and, if possible, night. If we need 4 pills (40 mEq) consider 1 liter of Crystal Light and three sodium bicarbonate pills (20 mEq). The beverage and individual pills can be spread out through the day. If we need 6 pills (60 mEq), consider 2 liters of Crystal light (40 mEq) and three sodium bicarbonate pills (20 mEq) likewise spread out through the day. Reserve the potassium citrate pills for when you tire of the beverage or if the extra sodium is raising blood pressure or urine calcium. Crystal Light is convenient because of how much citrate it contains. But the chart shows many alternatives which can be used instead in larger volumes. Just remember to multiply so the total amount of alkali remains about the same. For example, you need 2 liters of Diet 7-Up to equal one liter of Crystal Light. Mixing and matching is perfectly acceptable. Each day need not look like the one before so long as the correct amount of total alkali is used. The only drawback of a mix and match approach is confusion, so make lists and keep track. As a general rule, try to make the sodium component smaller than the beverage component. Keep the expensive potassium citrate pills as a convenience and source of variety. Obviously if sodium is contraindicated medically, and beverages are too tiresome as a source for all the alkali that is needed, potassium citrate pills can be used to replace sodium bicarbonate pills. This post is for those who have been told by their physicians to use alkali. Nothing I have written here should induce anyone to begin alkali unless their physician has prescribed or recommended it. Stone formation is complicated. Sometimes alkali can worsen stones, or even become a danger. Potassium can itself be dangerous if kidney function is below normal. Sodium loads are a problem for people with high blood pressure, heart disease, and other illnesses. Do not use sodium or potassium alkali or even high volumes of Crystal Light unless the physician who is treating your stones recommends you do so. Whatever caused the price rise, the changes in how insurers pay for this medication, or both, may be transitory. Millions of people have kidney stones in the US. Prices for 90 days of a standard treatment are so high that few can afford them without serious budgetary concerns. When so many people are affected, hopefully market or even political forces will countervail. In the meantime, between a few potassium citrate pills, a few liters of Crystal Light, and maybe some sodium bicarbonate, physicians can piece together an adequate regime of alkali for those patients who need it. Not every stone former does need alkali, of course. I have brought Crystal Light to your attention as an inexpensive substitute for some of the medicinal alkali your physicians may have prescribed. As in my initial ‘Loud Disclaimer’ I say here that I receive no financial or other benefits of any kind from the makers of this beverage, have not, in fact, ever tasted it, and do not currently plan to do so. My evidence for the value of Crystal Light comes from the work of Dr. John Asplin, and comparisons to the published work of Dr. Eisner and his colleagues. I have had kidney stones 5 times. The analysis came back 80% magnesium ammonium phosphate- struvite, 20% calcium phosphate hydroxy- and carbonate- apatite. I also have been diagnosed with diabetes type 2 managed with diet and exercise last A1C 6.1. I’m taking one over the counter potassium citrate supplement pill per day (99 mg). I am trying to eat food with less oscillates, combine food with foods with calcium, and limit protein. Any suggestions? Thanks. Good job on all the healthy changes you have made. Don’t forget to get enough calcium by food (for men this is 1,000mg/day) and drink enough fluids to produce at least 2.5 liters of urine per day. Seems like you are doing everything you need to do, but remember to do an annual urine collection to make sure these changes are having the desired effect! 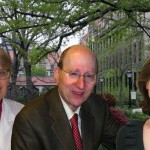 Dr. Coe, this site is very beneficial, thanks much to you. I recently had another bout of gout, and in working with my urologist have discovered I average a urine ph of 5.1, and am supersaturated with Uric Acid. The possibility of stones got my attention! Currently I am slamming Crystal Light Lemonade, made with alkaline water, along with some 275mg pills and herbal Uric Acid reducer, while measuring my ph 3-4 times a day to calibrate things. I am most acid the first of every morning, will try a lemonade at bedtime to see how that affects things. Question: Is this likely to be a permanent situation? If so, drinking lemonade daily is not a major burden!